Abstract: This case is gigantic. 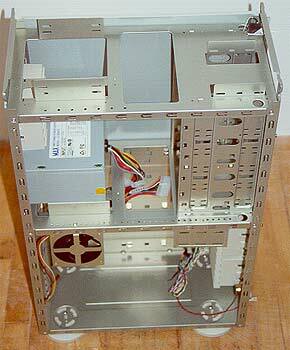 It comes with several fans, has a unique CPU fan, fold out doors, and locking bezel. It also costs a pretty penny... How does it fair considering the price? To install the top HDD, the top of the case must be removed. This is a not quite true for the FDD which thankfully can be put in with out having to remove something else. Heck, just think about that. To install a FDD the bezel comes off, the sides are unscrewed and opened - the last thing you want to do next is take off the top of the case as well!! Ever since I sliced my fingers open on a cheap case, which by its cheap nature had knife blade edges, rounded edges have been not a luxury but a necessity. This case is definitely user friendly, all metal edges are folded over so they are nice and smooth. The knock outs in the front of the case are a bit sharp, but that's to be expected. Luckily those areas are not common places to be sticking hands and fingers. Since I'm on the topic of metal, lets talk about the quality of the case material. We've seen some cases that are so thin, installing a peripheral in the 5.25" bays will warp them, lean on the frame and it bends and install a hard drive everything sways an inch or so. This case doesn't do that kind of crap. The outer panels, and inner framework are made of nice thick gauge steel (about 1.0 mm thick). While the outer panels are nicely coated in zinc, the inter panels are coated in shiny version of... I don't know. Anyway the frame is nicely coated with some manner of rust protection. While you would expect the power and reset buttons to be easily accessible, that is not always the case. I have a real hatred of cases that make you search out for a pen before you can reset the system. Thankfully, the Supermicro 750 has controls which are easy to use with just the hand. As far as hardware monitoring goes, things are rather simple. There are only three LED's: HDD activity, temperature warning and Power ON. While I have a found a few quirks with this case, I must say that overall it is still an excellent case. It costs, a pretty penny, but you at least feel you are getting your money's worth when you start to look inside, and notice the little touches that go into the 750. The swing out doors are really handy, and although you still need a screw driver to get them open, ease of access is not difficult. The height of the case may pose some problems for under the desk applications. Mainly because is just doesn't fit. But with a monitor extension cord, that point becomes moot. Eventually it all boils down to the internal layout, the multiple fans, and attempts at filtering incoming air. On these points the SuperMicro 750 scores high. So, while there are a few issues of convince that could be improved, the overall impression of this case is a strong one. If you have the cash, and are looking for something big to hold your system, this case makes an excellent choice overall.